Your driveway is extremely vulnerable to severe wear and tear, primarily from car traffic but also the weather. This is especially true if you have a blacktop driveway, which will inevitably sag and crack over time, making it unstable and unsightly. However, it’s water that you should actually watch out for. Just like the wood in your home and many of your property’s investments, water is the most harmful for deteriorating your blacktop driveway. Asphalt naturally cracks once water permeates; the chances of this happening increases hundred-fold when you factor in the sheer weight of the cars that drive over it. When cracks start forming and water causes even more damage, particularly in cold climates, you’re left with a driveway that’s lost its functionality. Aside from water, your driveway is also prone to damage from other elements including oxygen and sunlight. Both of these agents speed up corrosion. So how do you protect your blacktop driveway? The answer is by using a high-quality sealer. Only by using a sealer on your blacktop asphalt effectively prevents corrosion and damage brought about by water, oxygen, and sunlight. Of course, you can also choose to apply another layer of blacktop patching but that will only take up so much of your time, effort, and money. There are many good sealers on the market, but a new one has been released recently. Meet the Latex ite Driveway Sealer, which comes with a new fortified formula to eliminate skidding while filling hairline cracks. Despite being new, homeowners are already raving about how good this sealer is. The Latex ite Acrylic Plus Driveway Revitalizer Filler/Sealer is an acrylic-based formula made for blacktop driveways as well as walkways that haven’t been previously sealed. Having said that, it’s versatile enough to be used on driveways that have been sealed as well. It contains natural fillers that effectively fill up hairline cracks, and it leaves your driveway with a non-skid finish. Driveways also need to be cleaned up occasionally. After sealing, all you need is some soap and water to keep your driveway looking brand new. A few scrubs here and there, and you’re done. This sealer is also environmentally friendly because of its low VOC formula. It must be said that this sealer doesn’t just do the job of sealing and filling well. Latex ite Acrylic Plus Driveway Revitalizer Filler/Sealer is also formulated with no-fade technology, allowing your beautiful blacktop driveway to retain its matte black color. Worries of fading is a thing of the past once you’ve sealed it with this product. Best of all, your driveway will be protected from cracks, corrosion, and unsightly damage for years to come. Paying careful attention to the application process is critical to ensure that you prevent peeling and cracking. The instructions, though very easy to understand and straightforward, caution against using a brush or squeegee for applying Latex ite Driveway Sealer. The best way to apply it is by using a roller, and if the surface is very porous, use a ½” nap then work the sealer into the crevices. 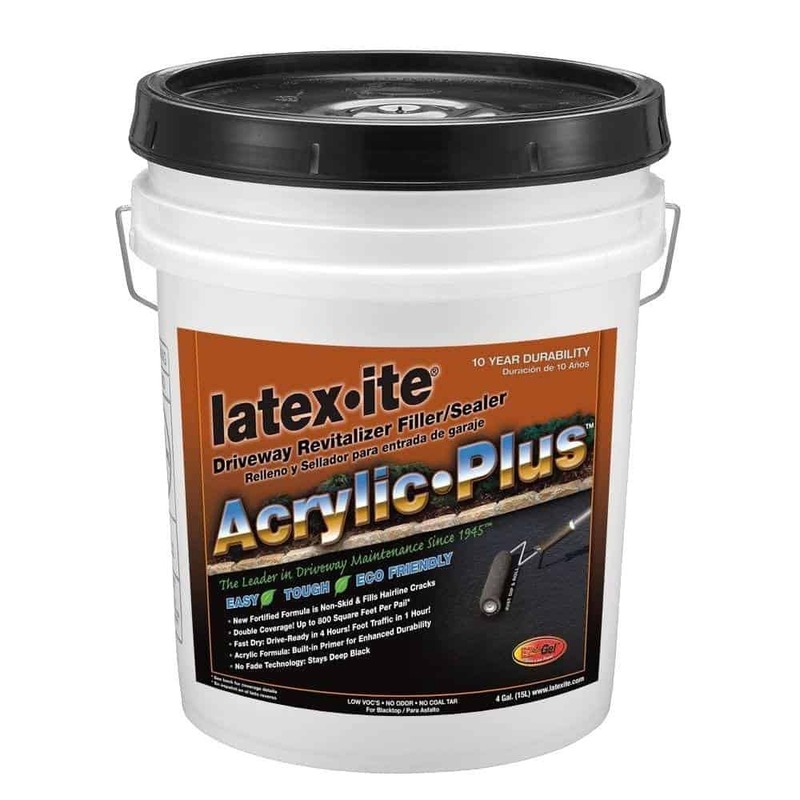 Latex ite Acrylic Plus Driveway Revitalizer Filler/Sealer dries fast, too! It will be ready for driving within just 4 hours, while it can take foot traffic in as little as one hour. The extremely economical formula of this sealer allows you to seal as much as 800 square feet in every 4-gallon pail. But it’s the condition of your blacktop driveway that has the biggest impact on coverage. A 4-gallon pail is good enough for sealing up to 800 square feet if a driveway is in good condition, is smooth, or has been previously sealed. The same amount can cover a driveway up to 700 square feet in size, with some cracks and graying. Lastly, a 4-gallon pail can seal up to 600 square feet of driveway that is rough, has been unsealed, or is gray. Other things to consider include the state of your asphalt; if it isn’t compact and if some stones are exposed, coverage will be less. If the surface is porous this means you’ll need to apply two coats. With all the competition for driveway sealers, a new product like Latex ite Driveway Sealer may have big shoes to fill. But when we read customer reviews online, we were glad to know that the manufacturer’s claims were not unfounded: this sealer truly delivers. Customers are very happy with the terrific results they saw after applying this sealer to their driveway. Some have even said that it performed better compared to the results of paying a professional to apply a sealer. If you’ve been thinking about sealing your driveway, take it from the ones who have purchased this sealer already and used it. They’re happy, and you will be too! Now that you’re convinced of the Latex ite Driveway Sealer’s prowess in protecting your driveway, you’re probably going to want to get one of your own. We have some good news: finding it online is easy! No need to head to your trusted home depot when you can have it shipped with a few clicks online from internet shops such as Amazon. Many homeowners take their driveways for granted until they start seeing the damage and experience the instability it causes. Don’t be one of them. Be a step ahead by using Latex ite Driveway Sealer to give your driveway the protection it deserves.